[SatNews] Lockheed Martin [NYSE:LMT] has delivered a new solar analysis payload that will help scientists measure and forecast space weather, which can damage satellites, electrical grids and communications systems on Earth. 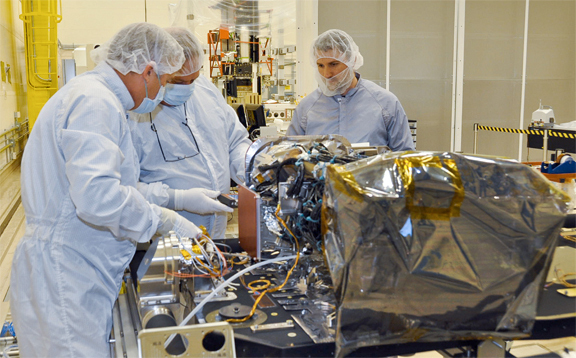 Lockheed Martin engineers in Denver install the Solar Ultraviolet Imager (SUVI) on the GOES-R Sun Pointing Platform. SUVI was built at the Lockheed Martin Advanced Technology Center in Palo Alto, California. The Solar Ultraviolet Imager (SUVI) instrument was integrated with the first flight vehicle of the National Oceanic and Atmospheric Administration’s (NOAA) next-generation Geostationary Operational Environmental Satellite, known as GOES-R. The GOES-R Series spacecraft are designed and built by Lockheed Martin in Denver, Colo.
“It is enormously satisfying to see the first GOES-R satellite and its instruments coming together, and it is great to see SUVI in flight configuration on the satellite’s Sun-Pointing Platform,” said Jeff Vanden Beukel, Lockheed Martin SUVI program director at the Advanced Technology Center in Palo Alto, where the instrument was built. “We look forward to continuing our collaboration with NASA and NOAA to produce state-of-the-art scientific instruments that increase safety and improve quality of life." SUVI will provide the required solar observational capabilities that enable NOAA’s Space Weather Prediction Center in Boulder, Colorado, to monitor solar activity and to issue accurate, real-time alerts when space weather could affect the performance and reliability of technological systems in space or on the ground through the enhanced detection of coronal holes, solar flares and coronal mass ejections, as well as improved geomagnetic storm and power blackout forecasts. Space weather can disrupt satellite operations, communications, navigation, and the distribution of electricity through power grids. Timely forecasts of severe space weather events would help satellite operators and electrical grid technicians mitigate potential damage to such systems. Lockheed Martin is under contract to build the first four next-generation GOES satellites (R, S, T, and U). Four of the six instruments for the GOES-R satellite have been delivered to the Denver facility and are being integrated with the spacecraft. Once the instrument complement is completely integrated, a full suite of environmental tests will be conducted. Launch of the GOES-R satellite is scheduled for the first quarter of 2016. Operational since 1975, the GOES program is operated by NOAA’s National Environmental Satellite, Data, and Information Service and is a critical part of the U.S. satellite constellation for environmental observations. The GOES satellites are a key element in NOAA’s National Weather Service operations, providing a continuous stream of environmental information (weather imagery and sounding data) used to support weather forecasting, severe-storm tracking and meteorological research. Along with weather forecasting, the GOES program also provides data to support space weather forecasting, public safety and scientific research to better understand land, atmosphere, ocean and climate interactions. NOAA manages the GOES-R Program through an integrated NOAA-NASA office, staffed with personnel from both agencies and located at NASA’s Goddard Space Flight Center in Greenbelt, Maryland.